Hello and welcome to this exciting lesson. I call this playing idea/ concept 3+2. It’s based on 3 notes on one string and 2 notes on an adjacent string. Rhythmically I play it as a quintuplet, meaning 5 notes on a beat. Let’s take a look a Example 1. It’s a chromatic ascending lick to showcase the grouping and picking technique. 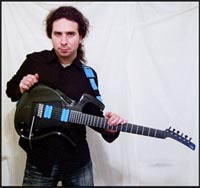 As you can see I am plying the first 3 notes with alternate picking and then when I cross the string I am using sweep picking. So I get down, up, down, down and then up. This seems a bit wired but you will see it will play nicely after some practice. Ok, let’s move to Example 2. It’s a C major excerpt and it is played the same way as the chromatic warm up. Play it slowly and make sure you are using the proper technique. As you can see, I am skipping the middle note in this 3 note per string shape. I play , B, C, D, E, and then G.
Ready for more ? OK, here we go. This example is based on an ascending Whole tone scale. Same idea as in example 3. This time you will have to pay more attention to the position changes as the shape moves diagonally in tritons across the fretboard. Cool, let’s apply this to a scale. This example is based on a C major 3 note per string scale. Same idea as in example 2. Play, C, D, E, F, and then skip G and play A. Restart on the A string and play F, G, A, B, skip C and play d and so on. It’s quite simple. Make sure you play all notes cleanly. All those examples are ascending only, but they are also easy to play as descending licks. Just start your group of 3 notes with an up stroke and then play a sweep pick ( up) to cross the string with the 2 notes. So, it’s UP, DOWN, UP, UP, DOWN.